Tue, Apr 16, 2019, 07:07 pm SL Time, ColomboPage News Desk, Sri Lanka. 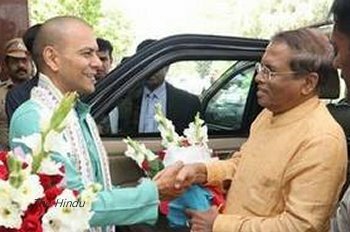 Apr 16, Tirumala: Sri Lankan President Maithripala Sirisena has arrived in Tirumala on a private visit on Tuesday to offer prayers at the hill shrine of Lord Venkateswara Swamy. The President would take part in the 'Suprabhatha' ritual and offer prayers to the presiding deity of Lord Venkateswara in the early hours Wednesday, the official added.